OUR PRICE: $14.15 - Join Rewards Get $1 Dance Dollars On This Item! 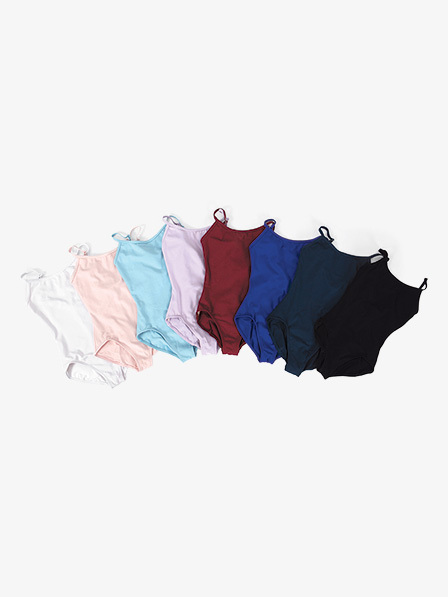 Capezio's "Classics Collection" camisole leotard features a basic scoop front, a V-back with adjustable straps, and a ballet cut leg line. Children's leotards have full front lining. Machine washable. It runs small compared to the sizing on the charts. This runs pretty true to size, maybe a bit on the small side. The quality is much better than I expected for the price. I love the back of this leotard - very flattering and beautiful. Would definitely recommend this leotard. My daughter loves this leotard, and it's well made with a very comfortable fit. I like that it has adjustable straps, and it fits true to size. Highly recommend. It's definetely made of high quality but there are some little flaws. It's a great leo but then again the front doesn't have a built in bra which is a problem because it doesn't look right if you wear one with it. And right where the straps are connected, it has lumps of material that hurt and press into your back. 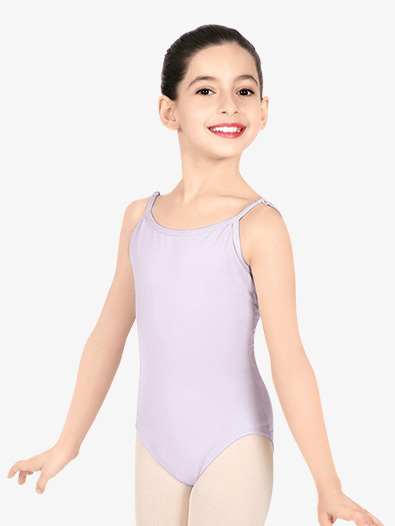 The fabric on the leotard seems durable and comfortable, and the fit was pretty true to size (I ordered based on girth, which I find to be best with Capezio leos), but daughter is complaining that the straps are too wide set. Sure, they are adjustable, but they sit well over the shoulder (view back photo). Another leo we have allows you to hook the straps onto other, closer to the middle, hooks, but these are fixed. You can, however, adjust the length and how tight they will be. Otherwise, it seems to be a great leotard, but keep in mind the wide set straps if you have a picky ballerina. I have a skinny little girl and this fit her fabulously! It wasn't too tight or too loose, and the adjustable straps should mean she will wear it for quite some time. She loves it, and I love that! My daughter is 9, and small for her age. She wears a size 7/8 clothing. I ordered the M - a size 8/10 according to size chart. Way too small, she could get it on but it was way too tight for her to wear. Am sending back and ordering larger size. I would recommend ordering a size up from whatever the size guideline tells you to order. I bought a medium and it perfectly fits me. I bought the color black when I wore it, it was very comfortable.